Since its inception in 1970, and with major, sustained support from the New York State Council on the Arts, Poets & Writers has provided fees to writers who give readings or conduct writing workshops in New York State. The program currently supports hundreds of writers each year participating in events taking place throughout New York. The Readings & Workshops program also supports writers taking part in events in the state of California and the cities of Atlanta, Chicago, Detroit, Houston, Seattle, New Orleans, Tucson, and Washington, D.C.
We support 2,000 literary events every year—that's an average of more than five a day! In Spring 2019 we launched United States of Writing, an initiative to expand our core programs to better serve writers coast to coast, especially writers of color and other historically marginalized groups. With generous support from the Hearst Foundations we’ve taken the first steps toward this national initiative with a focus on Detroit, New Orleans, and Houston. For more, see our press release. We’re pleased to introduce our new Literary Outreach Coordinators: Justin Rogers in Detroit, Kelly Harris in New Orleans, and Lupe Mendez in Houston. Literary Outreach Coordinators will help to increase awareness of Poets & Writers’ tools and resources for writers and work with us to contribute to strong literary communities in their cities. 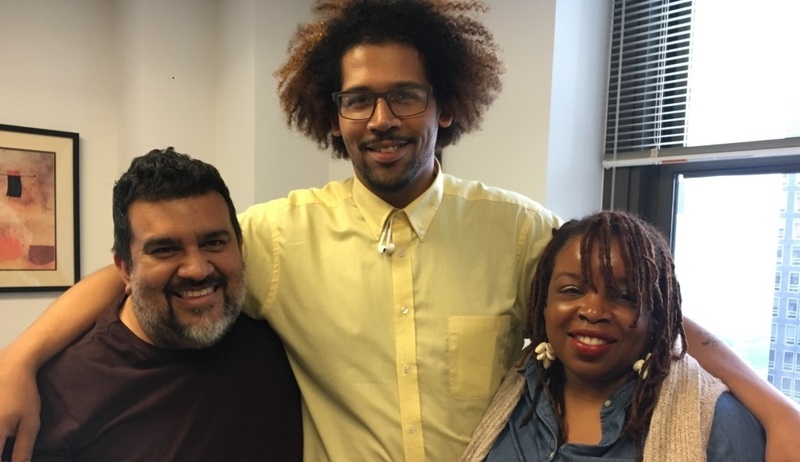 Lupe Mendez, Justin Rogers, and Kelly Harris visited Poets & Writers' New York offices for a project kick-off in April 2019. Kelly Harris received her MFA in Creative Writing from Lesley University and has received fellowships from the Fine Arts Work Center and Cave Canem. Her first poetry collection, Shame on Her, is forthcoming. Her work has appeared in Torch, Caduceus, Valley Voices, and Southern Review, among others, and is included in the anthology Say it Loud: Poems for James Brown. Harris has been an active member of the literary community, participating in a celebration of the National Park Service Centennial with NPS poet laureate Sonia Sanchez, serving as guest poetry editor for Bayou Magazine and as a board member of 826 NOLA. She currently curates programming for the literary festival Words & Music. Contact Kelly at NOLA@pw.org . Find her on Twitter at @NOLApworg #WritingInNOLA. Lupe Mendez is a poet, teacher, and activist. His collection Why I Am Like Tequila is forthcoming from Willow Books. He holds an MFA from the University of Texas at El Paso. His poetry has appeared in Luna Luna, Tinderbox Poetry Journal, Rabbit Catastrophe Review, Revista Síncope, Pilgrimage, Border Senses, Gigantic Sequence, and Gulf Coast, among others. Mendez is one of the founders of the Librotraficante Movement and of Tintero Projects. He has received fellowships from CantoMundo, Macondo, and the Poetry Incubator hosted by Crescendo Literary and the Poetry Foundation. Contact Lupe at Houston@pw.org . Find him on Twitter @Houstonpworg #WritingInHouston. Justin Rogers is a Black poet, educator, coach, and editor from Detroit. He is the author of micro-zine Nostalgia as Black Matilda (Rinky Dink Press, 2017) and the chapbook Black, Matilda (Glass Chapbook Series, 2019). His work is published or forthcoming in Tinderbox Poetry Journal, Mobius Magazine, Apiary Magazine, 3Elements Review, Skip-Fiction, Gramma Press, and Public Pool. He is the coordinator of InsideOut’s award winning after school program, Citywide Poets, and an advocate for literacy among inner-city youth and the amplification of Black voices. Contact Justin at Detroit@pw.org  and follow him on Twitter at @Detroitpworg #WritingInDetroit. Watch this space for more news about United States of Writing! A documentary look at a writing workshop for seniors at the Goddard Riverside Community Center in New York City, which Poets & Writers has funded since 2001. In New York State, the Readings & Workshops program is supported, in part, by the New York State Council on the Arts  with the support of Governor Andrew M. Cuomo and the New York State Legislature. In New York City, the Readings & Workshops program is also supported, in part, by public funds from the New York City Department of Cultural Affairs , in partnership with the City Council. In California, the Readings & Workshops program receives support from the California Arts Council , a state agency, and the National Endowment for the Arts , a federal agency. In Detroit, Houston, and New Orleans, the Readings & Workshops program receives support from the Hearst Foundations. Additional support is provided by the Louis & Anne Abrons Foundation, The Cowles Charitable Trust, the Frances Abbey Endowment, and Friends of Poets & Writers . For events taking place in New York State, Atlanta, Chicago, Detroit, New Orleans, or Washington, D.C., call (212) 226-3586 x225 or e-mail rw-east@pw.org . For events taking place in California, Houston, Seattle, or Tucson, call (310) 481-7195 or e-mail rw-west@pw.org .